Barter Theatre has been selected for the East Coast premier of Sundown, a wonderful new musical drama that recounts the events leading up to the famous Gunfight At The O.K. Corral, in October of 1881, the gunfight itself that lasted all of 90 seconds, and a brief glance at the legend it became. This show stands head and shoulders above any western-type musical I can remember, including such a favorite as Oklahoma. Actually, to compare Sundown to other western musicals is probably unfair to all. Sundown, although containing singing, dancing, and some pretty funny bits, has a gritty, almost morbid reality to it that befits its subject, a shootout more of an ambush, really that resulted in the immediate deaths of three men, the severe wounding of two more, and, probably, the final curtain call on what we today know as The Old West. The Barters own John Hardy plays Doc Holliday, the tubercular Georgia dentist turned cardsharp, alleged Wells-Fargo stagecoach robber, and ladies man. Hardy is perfectly cast as Holliday, a man keenly aware of his own legend, yet grappling with the fact that he is dying of bloody consumption. It is primarily from the viewpoint of Holliday that we see the escalation into violence of what amounted, some historians believe, to little more than an ongoing feud between two rival groups, the Earp brothers, Morgan, Virgil, and Wyatt, along with Doc Holliday, and their rivals consisting primarily of Billy and Ike Clanton and Frank and Tom McLaury. The truth about who was in the right, if anybody probably nobody; who fired first; and whether justice or vengeance was served has long ago blown away in the dusty Arizona wind. Even at the time few people agreed whether Wyatt Earp, who had been briefly the sheriff of Tombstone, was an upstanding citizen defending the town against a marauding gang or if he was, in fact, little better than the gang himself. This is not a story about saints. Derek Davidson plays Wyatt Earp, Chris Ross plays Morgan Earp, and John Hedges plays Virgil Earp. Dressed all in black, the Earps and Doc Holliday, very nicely counter play the good guys cliques, while the Clantons and McLaurys, supposedly the bad guys, look far less sinister. 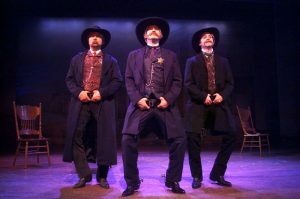 Mike Ostroski plays Billy Clanton, Eugene Wolf plays Ike Clanton, Peter Yonka plays Frank McLaury, and JJ Musgrove plays Tom McLaury. Nicholas Piper, whose absence from Barter casts has been noted for the past couple of years, is back as John Behan, a friend of the Clantons and McLaurys, who was the sheriff of Tombstone at the time of the famous shootout. Piper is a fine and versatile actor and it is good to have him home. Docs girlfriend, Kate Fisher, known as Big Nose Kate, is played by Kathryn Foster, a beautiful newcomer to the Barter stage. Her character, a drifting bar girl, pickpocket, and sometimes prostitute, is nicely done and believable. Finally, the magnificent Evalyn Baron rounds out the cast as the Woman In Black or, if one so chooses, Death. Her presence is felt throughout the play, but in the end she has to wait for the dramas two principals Wyatt Earp and Holliday. Earp would live into a ripe old age in California as a real estate speculator and Holliday would live at least a dozen more years before finally dying in a sanitarium in Colorado. This play has several fantastic songs, probably the best of which is the first: Arizona Morning sung by Holliday (Hardy) and the ensemble. Other notable numbers include We Aint Never Had It So Good, Politickin, Bridges, sung by Kate, and Another Time, by Kate and Doc. This is a play that seems particularly well cast. The set, while simple, works wonderfully. And all the other stuff such as sound, lighting, etc. is, of course, up to the Barters usual high standards. Richard Rose directs and choreographed. William Perry Morgan leads the live four-piece orchestra. Sundown had its world premier in Irving, Texas, at the Lyric Stage. The music is by Peter Link with lyrics by Larry Rosler. The book is by Joe Bravaco and Larry Rosler. If youd like to read a bit more about the history of the shootout at the O.K. Corral and the bad blood between the Earps, the Clantons, and the McLaurys, a good Internet site is www.jcs-group.com/oldwest/towns/okcorral.html. This site gives an 11-page history. Checking out this site makes Sundown much more enjoyable. I do have a warning, however, and it is an important one to note. This play contains quite a bit of pretty realistic gunfire and it gets quite noisy. Several times members of the cast point their weapons (pistols and one double-barreled shotgun) in the direction of the audience. They are not shooting toward the audience or at the audience, but just the fact of having a firearm, even a harmless stage firearm, pointed in my direction is a bit unnerving. And, please understand, I like guns, own guns, and have shot guns all my life, including in the military. For those among us, however, who only know firearms from their movie or television depictioneither in shows or on the newssuch gunplay might cause some deal of discomfort. You are, of course, certainly never in any danger and, by the time you read this the choreography will probably be a bit revised to reduce the illusion of such. This warning is not meant to keep you from attending a great musical play and I hope it doesnt. Just go advised that there is gunplay and it is fairly realistic. Sundown runs through May 17 on the Barter Mainstage. For times, dates, and reservations, call the Box Office at 276-628-3991 or visit Barter online at www.bartertheatre.com.